The Samsung Galaxy S6 Edge+ is a true rival to Apple's iPhone 6 Plus, with phablet-sized dimensions and a stylish premium glass and aluminum design. It's display is curved on the sides, giving it a more futuristic look, and its specs and camera have Apple playing catch-up. That iPhone 6S and iPhone 6S Plus can't come soon enough for the Cupertino company. 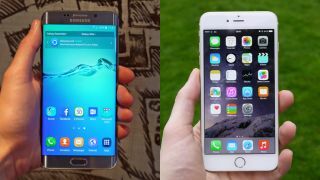 Both are among the best phones their class, and a lot of it comes down to your needs and if you prefer Android 5.0 Lollipop or, soon, iOS 9. Here's how they break down. Both the Samsung Galaxy S6 Edge+ and iPhone 6 Plus require two hands to properly operate, with dimensions that trump the 4.7-inch iPhone 6 and 5.1-inch Samsung Galaxy S6. The Edge+ is 154.4 x 75.8 x 6.9mm, while the iPhone 6 Plus is 158.1mm x 77.8mm x 7.1mm. Even with the bigger screen, Samsung's phone features a smaller home button and less bezel, and it weighs less at 153g vs Apple's 172g. Both feel nice in the hand, with premium materials: Samsung uses glass and aluminum, ditching the plastic build of last year's phones, and Apple uses a straight-up aluminum unibody. What sets the S6 Edge+ apart is that curved display that makes it stand out like a phone in 2015 really should. It's no different than the S6 Edge, but we like it. Samsung's phones always to impress with a Super AMOLED displays, and the S6 Edge+ is no different with a 5.7-inch curved screen. Apple's 5.5-inch display is also a bright contender, but it doesn't push the the screen to the max, with a 1920 x 1080 resolution. Samsung's phones are now up to quad HD levels at 2560 x 1440. The pixel count for Apple's phablet ends up being 401ppi, while Samsung packs in 518ppi stretched over top of a larger display. They both look good, but Samsung's display is slightly better. The Edge+ comes with new edge-swiping functionality to view other Edge contacts and recently used apps, but the iPhone has the better shortcut menu system in place, at least in the iOS 9 beta. These are Samsung and Apple's top-of-the-line phones, with internal specs that should get you through the next two years without a hitch. Edge+ has the more powerful components, with company's benchmark-topping Exynos 7420 octa-core processor, the same one that's in the Samsung Galaxy S6. At the heart of the iPhone 6 Plus is its custom Apple A8 System on a Chip, which is plenty fast for most phone users' tasks, even if it scored lower in benchmark tests. Edge+ has extra RAM compared to the S6 Edge, with 4GB instead of 3GB. That should make the updated benchmark tests really interesting when we do review the new phone. Apple sticks with just 1GB of RAM. Edge+ also edges out its competition, ever so slightly, with a 3,000mAh battery, while the iPhone 6 Plus is a hair smaller with a 2915 mAh battery. Here's where the iPhone 6 Plus may win you over: its internal storage goes up to 128GB, with the other options being 16GB and 64GB. Edge+ is limited to 32GB and 64GB. Snapping photos with the Edge+ and iPhone 6 Plus is fast and easy. Both capture moments with easy-to-access camera apps and high-end point-and-shoot-level results. Our past experience with the 16MP Galaxy Edge camera - the same one found in the Edge+ - has taught us that Samsung does it better with its f/1.9 aperture. The 5MP front-facing camera also performs better than Apple's 1.2MP camera. The iPhone 6 Plus, to its credits takes excellent photos, too, and its color tends to be more true-to-life in some scenarios. This is one area Apple needs to up its game with the iPhone 6S and iPhone 6S Plus next month. iPhone 6 Plus has been out for almost a year, meaning it's due for a refresh, and the current price has some dropped if you shop around. It launched at $750 (£619, AU$999), a price that remains at the Apple Store, in true fashion. Don't look for deals there. The official Samsung Galaxy S6 Edge+ release date in the US is August 21, with pre-orders beginning today. It will cost $299.99/$399.99 for 32GB and 64GB models on contract, and $814.99/$914.99 off. In the UK and Australia, pricing could be around £600 and AU$1275. We'll just have to wait and see. The exact price and release date in other countries will be determined by carriers, but expect those details well before Apple has a chance to announce it's new iPhone. There's no question that if you want a phablet powering iOS 9, you should go with Apple's iPhone 6 Plus. If you want one running Android 5.1 Lollipop, Samsung Galaxy Edge+ is your answer, with the Samsung Note 5 being an alternative with its S-Pen stylus powers but flat display. That said, feature-by-feature, Samsung has found a way to outperform its chief smartphone rival, with a better specs, a high resolution display, a bigger battery and sharper camera. It doesn't quite reach the 128GB levels of internal storage, and the exact price remains a mystery. Both letdowns could be deal breakers for anyone on the phablet fence.